Here are a few more English words that sound like Chinese words. These and the examples that I mentioned previously are not exhaustive by any means. You will discover many more on your own as you enlarge your Chinese vocabulary. As for the Chinese homophones, trust me, there are tons more. This is one of the reasons why the modern Chinese language is replete with polysyllable words. Combining a character with one or more other characters greatly reduces the ambiguity created by the homonyms of the individual characters. Zhè shì wǒ de mìmì. Bùyào tīng tā de tián yán mì yǔ. Don’t listen to his sweet talk. Tā de mèimei hěn piàoliàng. His younger sister is very pretty. In case it rains, what to do? Nǐ zhèyàng ānpái, hěn hǎo. You’ve made a good plan. Nǐ dǎ pūkè pái ma? Well, in the sense of 诉讼 (sùsòng law suit, litigation), here we have a Mandarin English coincidence. While driving a car, do not break the speed limit. Nǐ dàitì wǒ qù, hǎo ma? Go in my place, okay? Tā tì wǒ tì le húzi. He shaved my beard for me. Wǒ xiǎng mǎi yī bǎ tìdāo. I’d like to buy a razor. Tā wèi nǐ liú le bùshǎo yǎnlèi. She shed a lot of tears for your sake. This soup taste pretty good (not bad). Wǒ de wèi bùdà shūfu. My stomach does not feel very well. Please walk on the righ side. This nursery school is not bad. 您 (nín) is the polite form of you. Tā de chuānzhuó hěn súqi. His apparael shows poor taste. 噜 (lū) is a grumble, a chatter, or a gurgling sound. Bù zhīdào tāmen jīligūlū de zài shuō xiē shénme. Don’t know what they are jabbering about. 徐 (xú) is a Chinese last name. It also means slow. This word is used more in writing than in everyday speech. 鼻 (bí) is the nose, which is usually referred to as 鼻子 (bízi). 北 (běi) is the north direction. 给 (gěi) is to give. 拍 (pāi) is to pat or to beat. It can also be used as a noun that means a clap, a slap, a swat or a musical beat. 拍手 (pāishǒu) is to clap one’s hands. 改 (gǎi) means to change or to alter. He changed his travel plan. As a verb, 透 (tòu) means to penetrate. As an adverb it means “thoroughly”. 透明 (tòumíng) means transparent. 透 (tòu) sounds just like “toe”. That’s it for now, folks. But wait, I hear a cow go, “Moo!”. Does she mean 母 (mǔ mother, female [animal]) or 亩 (mǔ a unit of area, about 0.0667 hectare)? 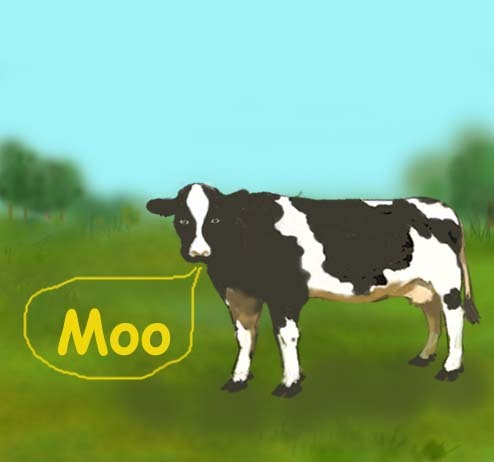 Today we will look at a few more one-syllable English words that sound like Chinese. For each of these English words, there are many additional Chinese homophones that are not included here. Also, if you utter the English word using a different “tone”, then it will correspond to a different list of Chinese homophones. In any case, I hope that this list will help you remember a few Chinese words by phonic association. I have rice every day. Nàr yǒu gè màimiàn de tānfàn. Over there there’s a noodle peddler. Nà shì yī gè gòuwùzhōngxīn. That is a shopping center. I like to listen to stories (literally, past events). Wǒmen yīnggāi zhàogu niánlǎo de fùmǔ. We should look after our elderly parents. He is coming the day after tomorrow. It’s a cloudy day today. Nǐ xǐhuān tīng nǎ yī zhǒng yīnyuè? Tā shì wǒ de jiùjiù. Tā liú le bùshǎo yǎnlèi. She shed a lot of tears. Nǐ xǐhuān chī lízi ma? Do you like to eat pears? Parting is a painful event. This house is crudely built. One of the things that contribute to the difficulty of learning the Chinese language is the abunance of homophones, i.e. different characters or different words that sound exactly the same. If you look up a Chinese character in a dictionary by its pinyin, you will often find many more than what you asked for. When you have become proficient in the language, you will be able to determine the correct character used based on the context, or based on the polysyllable word in which the character occurs. However, the beginning learner is likely to be confused. For example, 愚人 (yúrén) is a fool, while 渔人 (yúrén) is a fisherman. In fact, to avoid confusion, we usually say 傻子 (shǎzi a fool) instead of 愚人 (yúrén). On the other hand, it’s not that bad if you look at it this way: You only need to learn one sound to cover a number of different Chinese words. In fact, many of these sounds are plain everyday English words. Therefore, you are uttering a few Chinese words everyday without knowing it. Just look at the following examples, and you will see. Don’t be in my way. Tā zhàn zài wǒ de bèihòu. She is standing behnd me. Qiángbì shàng yǒu zhǐ chóng. There is an insect on the wall. Yī bù yī bù mànmàn zǒu. Walk slowly, step by step. Wǒ dì di hái tài xiǎo. My brother is still too young. Tā zuò zài dì shàng. Nǐ dài wǒ qù, hǎo ma? Dòufu shì yòng huángdòu zuò de. Bean curds are made from soybeans. Wǒ shì dòu zhe nǐ wánr de. Nǐ ài chī dànhuáng hái shì dànbái? Do you prefer to eat yolks or egg whites? This soup is rather light in taste. Wǒ zuò wánbì le, dànshì tā bù mǎnyì. I have completed the job, but he is not pleased. That’s right, this is a compund sentence. nàme, wǒmen háishì bùnéng jiànmiàn. then we still won’t be able to meet. All the sentence patterns that I presented previously belong to the category of the simple sentence, which basically consists of one subject and one predicate. There’s really nothing complicated about compound and complex sentences. You are using them all the time. The Chinese form compound and complex sentences in much the same way as you do in English. When you stick two or more independent statements together, you have formed a compound sentence. Each statement within a compound sentence follows the structure of a simple sentence, and is called an independent clause. Just as we have likened the simple sentence to a small one-story dwelling, we could think of a compound sentence as a one-story duplex, triplex or quadruplex. Each individual unit is an independent entity that does not affect the other units. The independent statements in a compound sentence are usually joined togther by such conjuctives as “and”, “or”, “but” and “however”. Wǒ huì shuō yīngyǔ, wǒ yě huì shuō pútáoyáyǔ. I speak English, and I also speak Portuguese. 可是. (kěshì) and 但是. (dànshì) both mean “but” or “however”. Wǒ huì shuō yīngyǔ, kěshì wǒ bùhuì shuō pútáoyáyǔ. I speak English, but I cannot speak Portuguese. A complex sentence is like a two-story house, the upper story being dependent on the lower story because it cannot stand on its own. There are a few different types of dependent clauses. The following examples employ adverbial clauses that describe a condition under which the action in the independent clause takes place. For additional examples of the various types of dependent clauses, see Chapter 25 of “Learn Chinese through Songs and Rhymes”. Rúguǒ lèi le, xiūxī yīxià ba. If you feel tired, rest a bit. Obviously, “If you feel tired” is not a complete sentence. If you just say this to someone, and nothing else, he or she would be cranking his or her neck in anticipation of what’s to follow. This is why such a clause is called a dependent clause. The main statement, “rest a bit” is the independent clause. The following line is quoted from the second stanza of 情人的眼泪 (qíngrén de yǎnlèi), or “Lover’s Tears”. We talked about the first stanza of this song in a previous post. Wǒ yǎnlèi bùhuì diào xiàlai, diào xiàlai. my tears won’t be falling down, falling down. nàme, nǐ zuìhào bǎ yǔsǎn dài hǎo. then it’s best that you bring the umbrella along. Just as with English, you can often omit a few words from a sentence and still retain its full meaning. You can see how this is done in the third stanza of the lyrics for the song, 雨中即景 (Yǔ Zhōng Jíjǐng The Rain Impromptu), which we looked at previously. zuìhào bǎ yǔsǎn dài hǎo. it would be best to bring the umbrella along. Here we are talking about the eqivalent of a two-story duplex, in which one of the two units may be a single-level abode. 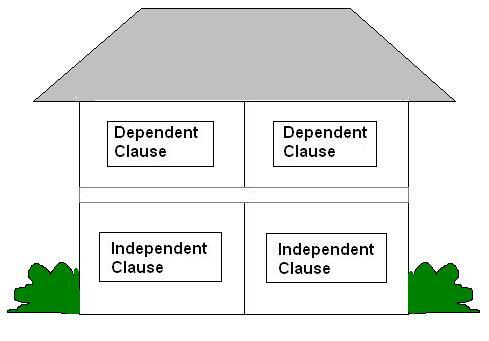 The following example contains two independent clauses and one dependent clause. Do you see that “如果下雨 (rúguǒ xiàyǔ)” is the dependent clause? Wǒ huì lái, dànshì rúguǒ xiàyǔ, wǒ huì chídào. I will come, but if it rains then I will be late. In the song, 給我一個吻 (Gěi Wǒ Yī Gè Wěn Give Me A Kiss), that we talked about before, there are actually two pairs of independent clauses nestled within a complex sentence structure. wǒ yě yào xiàng nǐ qǐngqiú, juébù huīxīn. I still will beg you, and won’t lose heart. Now, how would you translate the following sentence to Chinese? He will come, but if when he comes, I’m not here, then we still won’t be able to meet.